Here’s the deal. You love to travel; I get that. I do too. I also like to party. You probably do too. So, I am going to let you in on a secret that you may or may not be aware of. Ibiza and Las Vegas have so much competition nowadays. So does Rio de Janero and all of the other rightfully perceived party hotspots of the world. I want you to get the most out of life. You do too. That’s why you travel. But I want you to let off some steam, man! Let me let you let off some steam. Here’s five places to visit if you want to party and party hard, and yes, they’re in countries you never would have guessed. Yeah, we are starting off with the most unlikely country. Check this out; Pag is home to some of the most epic nightclubs out! Aquarius begins their days with pool parties, while the party hardly ever stops at Zrce beach. One of the obvious highlights for many adventurous partygoers though is the beautiful Club Papaya in Novalja. We say beautiful for a few reasons. 1. It’s mainly all outdoors, giving the atmosphere a different feel than the stuffy, humid nightclubs you see everywhere else. The list of places to go here is pretty much endless! There are places to relax over cocktails and there are places to go hard, fast! Enjoy your travels to Croatia! In Israel, you go to Haifa to work, Jerusalem to learn and Tel Aviv to play. And play, you will. This is the cultural epicentre of Israel, the kind of place where a ‘chaser’ is a shot and said shot is always double alcohol. The bartenders are not by any means conservative, which is something to look forward to when you’re dancing on the floor, drink in one hand and cigarette in other (that’s right, they don’t police things like that). Some of the best clubs are underground, such as Bootleg Club and The Block, which is known in Israel as having the best sound quality. Not the best drinks though; leave that for the Craft Cocktail Bar, hidden deep in the Imperial Hotel. Oh, and if you’re after a beautiful night with a beautiful woman, that’s remarkably unlikely. They are smart and aren’t suckers, but if you’re persistent and want the challenge, try Kuli Alma or Alphabet and Radio. You know they know how to party when they are communist-turned-capitalist. They are, in that respect, allowed to be absolutely crazy. Surprisingly though, more of what you will find in this gorgeously vibrant city lean towards classiness. 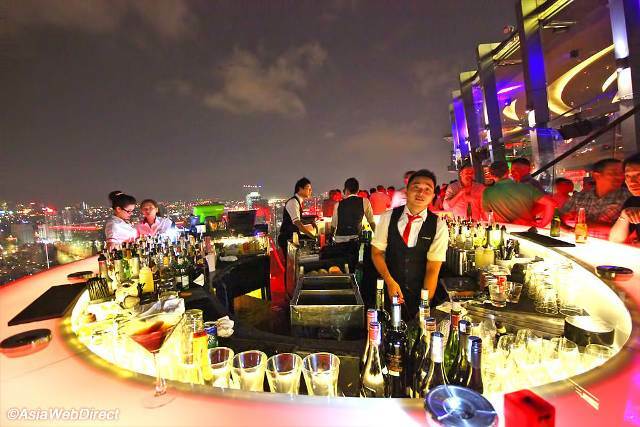 This rooftop cocktail bar mixes everything above. Have a photo! Go crazy, and send us over a picture from this view! You’re aware that you’re about to party when the party doesn’t actually start til 2am. That’s around about the time the nightclubs fill up and the crazy ones come out to play. And the venues cater to that crowd. Kapital Madrid has an astounding seven floor. SEVEN FLOORS! I live in Brisbane, and a few floors at The Met was impressive enough for me, let alone seven! Jesus. That’s impressive. Sorry, I can’t finish the article; booking tickets to Madrid. Pot café’s, canals and Van Gogh…Forget about it all, because Amsterdam holds host to some of the most innovative and trendiest bars, clubs and even schools to cater to your nightlife. SCHOOLS? Oh, yeah…schools. De School, a former school now operates as a 24-hour venue, equipped with a yard, a gym and a nghtclub. Here’s a photo of the old school bike shed-turned-nightclub. The nightlife here is so crazy that Amsterdam’s capital was the first in the world to actually appoint a mayor to oversee the night time shenanigans. Amsterdam continues to be a total cream-fest for the world’s biggest DJ’s and venues, and if you want to party, you need to go here. Now. Actually, I’m going to go. Madrid can wait.